Drosophila is a genus of small flies, belonging to the family Drosophilidae, whose members are often called "fruit flies". There are many species in this genus. Some do prefer places where there is rotting fruit. The adults may feed on nectar, and may lay their eggs on or near decaying fruit. The details differ greatly from species to species. The largest number of species is in the Hawaiian Islands. 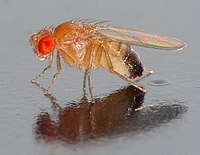 One species of Drosophila in particular, D. melanogaster, has been heavily used in research in genetics and is a common model organism in developmental biology. The genus has more than 1,500 species, and has varied appearance, behaviour, and breeding habitats. One species, Drosophila bifurca, has 58 mm (2.3 in) long. The cells are mostly tail, and are delivered to the females in tangled coils. Those Drosophila species with very long s make relatively few cells. D. melanogaster cells are a more modest 1.8 mm long, although this is still about 300 times longer than a human . Several species in the D.
Drosophila vary widely in their reproductive capacity. Those such as D. melanogaster that breed in large, scarce resources have ovaries that mature 10–20 eggs at a time, and can be laid together in one place. Others, which breed in common but less nutritious places (such as leaves), may only lay one egg each day. The eggs have one or more respiratory filaments near the front end; the tips of these extend above the surface and allow oxygen to reach the embryo. Larvae feed not on vegetable matter but on the yeasts and microorganisms present on the decaying surface of leaves or fruits. Development time varies widely between species (between seven and more than 60 days) and depends on factors such as temperature, breeding substrate, and crowding. ↑ Bächli G. 1999–2006. TaxoDros: The database on taxonomy of Drosophilidae. ↑ 2.0 2.1 Scott Pitnick, Greg S. Spicer & Therese A. issue=6527. p. 109. doi:10.1038/375109a0 . PMID 7753164 . ↑ Dominique Joly, Nathalie Luck & Béatrice Dejonghe (2007). "Adaptation to long in Drosophila: correlated development of the roller and packaging". Journal of Experimental Zoology B: Molecular and Developmental Evolution 310B (2): 167–178. doi:10.1002/jez.b.21167 . PMID 17377954 . ↑ Arnqvist, Göran; Rowe, Locke (2005). Princeton N.J: Monographs in Behavior and Ecology, Princeton University Press. pp. 87–91. ISBN 978-0-691-12218-2 . ↑ Kamimura, Yoaka (2007). "Twin intromittent organs of Drosophila for traumatic". Biol Lett. (The Royal Society) 3 (4): 401–404. doi:10.1098/rsbl.2007.0192 . PMC 2391172 . PMID 17519186 . This page was last changed on 1 April 2014, at 18:23.